Last time I paid attention to Superboy he was simply a younger version of Superman living in Smallville with Ma and Pa Kent. That version of the character, which formed the basis of the recent Smallville television program (that I didn’t watch), was pretty much wiped out of DC continuity following John Byrne’s 1986 “Post-Crisis” reboot of Superman’s history in the famous “Man of Steel” limited series. Since then there have been a handful of characters named Superboy, none of whom have really been all that popular (and one of whom was a major villain). This new take on the character seems to be a clean reboot of the last version of the character, a clone created from the DNA of Superman and Lex Luthor. He has telekinetic powers that not only grant him the illusion of Superman’s strength and ability to fly, but also allow him to move objects and give him increased awareness of his surroundings, like what’s going on behind shaded glass in the next room. The action begins in a secret laboratory of an organization called N.O.W.H.E.R.E., which seems to have created the clone as a sort of living weapon of mass destruction. As the story opens, Superboy is floating in a tank of nutrient fluid while technicians monitor equipment that tracks his various life signs. Captions narrate the scene from within Superboy’s mind. He’s been alive only about three months, near as he can tell, and in that time he’s intuited an enormous amount about his creators (or are they his jailers?). For starters, he seems to share some sort of empathic bond with an orange-haired technician he calls Red. This bespectacled young woman appears to be a psychologist, and while a computer screen suggests that her first name may be Caitlin, I strongly suspect she will turn out to be long-time Superboy love interest Lana Lang, who has featured in most of the various Superboy incarnations. N.O.W.H.E.R.E.’s instruments don’t register Superboy’s brainwaves because his alien DNA distributes his mind evenly across every cell in his body, and since the clone has not really moved since its birth, Red’s senior officer decides to terminate it. As cyanide flows into his tank, Superboy snaps into action and flies out of the tank and across the room like an out of control pinball, blowing up machines as he crashes into them. This kills a whole lot of people, including the superior officer, who is engulfed in flame just as he is about to tell Red the identity of the human DNA donor. Or it means that one of Superboy’s two daddies is Lex Luthor. Which is a great premise for a comic about a clone of Superman, so I’m glad they decided to stick with this idea, even if I never bothered to read much of the previous version. I mean, that character originated in the early 1990s, and for a while there he wore a totally radical leather jacket and sunglasses. I wasn’t going to be caught dead reading about such a dumb-looking character, but at least here it looks like the Superclone is at least going to be pretty cool-looking. Anyway, after trashing the labs and killing lots of scientists (pretty much accidentally, but still…), Superboy drops into Red’s arms, unconscious. Cut to a month later, and now Superboy is enrolled in school in a Kansas town that looks just like—but isn’t—Smallville. One of his classmates is a somewhat nihilistic white-haired girl named Rose Wilson, whom longtime readers know is the daughter of Deathstroke, the Terminator (who also had a new comic this week). This version of Rose turns out to be a “Mary Sue” avatar of Red, who has been monitoring the whole situation from a laboratory. Not-Smallville, it appears, is simply a holographic program meant to dredge Superboy’s “cellular subconscious” for memories of his parent donors. The real Rose Wilson shortly arrives in the real world, and makes it clear that she has been hired to kill Superboy should the clone go out of control again. Superboy himself is not fooled by the VR ruse, but goes along with it. He seems to lack empathy, as he doesn’t notice or refuses to help a woman screaming from a burning building. There’s something wrong with him, presumably because of Lex Luthor DNA (but the comic hasn’t made this explicit, and plays it as something of a mystery). Or is it simply that Superboy’s powers allow him to sense that the fire and the danger is not real, so he simply ignores it? What exactly Lobdell is going for here remains opaque to the reader, but I’m not sure if that’s intentional to build up mystery, or simply a bit of sloppy storytelling. Lobdell has been at the comics game for a long time, so I’m going to give him credit and assume that Superboy is aware of the fire and doesn’t bother to help because he knows it’s fake, but I do wish the story provided at least one piece of evidence one way or the other. One of Red’s fellow doctors, Umber (they all have color code names, you see?) fears the multi-national, possibly nefarious nature of N.O.W.H.E.R.E., and contacts the only uncontrolled journalist he knows: Lois Lane. Then, some high-up named Templar arrives, and decides to release Superboy into the world ahead of schedule. 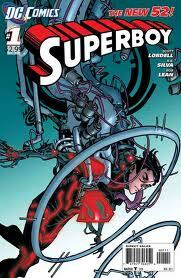 He has several unusual problems he needs solved, and he thinks Superboy is the solution. A final splash panel showing Superboy in costume posed with other members of the new version of the Teen Titans suggests that Templar wants to use Superboy as a sleeper agent within the Titans organization. Lobdell does a nice job establishing the basics of the character. All of my questions have to do with how longtime DCU elements like Lana Lang, Rose Wilson, and to some extent even the previous Superboy fit into this story. A brand new reader wouldn’t know about any of that stuff, and wouldn’t care. I suspect that reader would have no problem identifying with Superboy (the captions help get a sense of his character and personality). R.B. Silva’s art works perfectly about 80% of the time. His fine lineweights grant a certain elegance to his illustrations helped with excellent colors by “The Hories” (whatever that is). At times, though, especially when Red is talking with her boss on page 4, they almost feel too light, more akin to the kind of speed drawing you see in a lot of manga than you’d expect in traditional western comics. Incidentally, inker Rob Lean probably felt guilty cashing his check for this issue, as Silva’s style is all about thin lines with very little shadow. Lucky break for that guy. All in all, Superboy accomplishes everything a new #1 needs to accomplish. I’m not sure I’m all that interested in where the story is going in the long term, but it stands a good chance of looking pretty cool along the way, and I’ll keep buying it until it gives me a reason not to. According to sleuthier reviewers, “Red” is not Lana Lang, but is in fact Caitlin Fairchild, one of Jim Lee’s Gen 13 characters from the Wildstorm Universe. Curiouser and curiouser….